See How an EcoSafe® Green Fundraiser Can impact your community and global climate change! Certified compostable bags have been shown to increase the diversion of food waste to compost facilities that manufacture compost that creates healthy soils to grow nutrient rich all natural healthy foods. Research has shown that composting using compostable liners made with ecovio® reduces the “yuck factor” in collection which increases participation in residential composting programs. 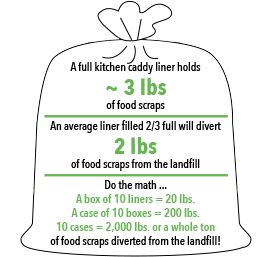 An average household will create 5lbs of food scraps each week. Let’s work together to make Washington State the leader in organic waste diversion. Challenge 10 friends, family, neighbors or your school to compost and collect over A TON of food scraps!